Damage Functions (DFs) translate physical damage to property, resulting from natural disasters, to ﬁnancial damage. FEMA in USA developed several thousand DFs and these serve as a benchmark in natural catastrophe modeling, both in academia and industry. However, these DFs and their documentation are buried within FEMA’s HAZUS software and are not easily accessible for analysis and visualization. 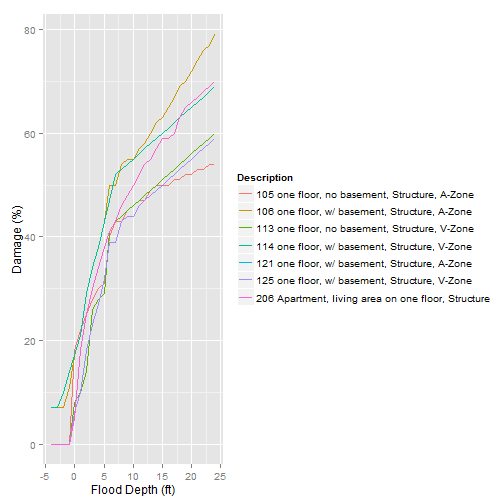 The hazus package provides more than 1300 raw DFs used by FEMA’s HAZUS software and also functionality to extract and visualize DFs speciﬁc to the ﬂood hazard. Here is the link to the package home on CRAN. Below is a graphic from the package vignette in R markdown.